There is a cardinal rule when it comes to soap operas, the guilty are usually innocent and the innocent are usually guilty, and no one stays dead. CBS’s daytime drama The Young and the Restless is no exception. It has become clear over the last few weeks that Adam Newman is very much alive, and it has also become clear that Stich and Kelly are harboring a big secret, and a dark one at that. Adam Newman allegedly killed Billy and Chloe’s daughter Delia in a hit-and-run accident. And, then he was thought to be killed in a fiery explosion after he was in a car accident. Fans doubted Adam Newman was really the hit and run driver that killed Delia, and even more fans doubted that Adam Newman was actually dead. It is beginning to look like The Young and the Restless storylines surrounding Adam Newman have all been carefully manipulated by producer Jill Farren Phelps to cater to her decision to fire fan favorite Michael Muhney (the actor that played the role of Adam Newman). Now, Phelps is rumored to be finding a Muhney replacement to play the part of Adam Newman, so she is bringing the character back to life. And, now that she is bringing Adam back to life and getting ready to toss her Muhney replacement into the lions’ den, she is once again manipulating the storylines and creating a shadow of doubt on whether or not Adam Newman is Delia’s killer. Whoever the new actor playing the role of Adam Newman is, he is already going to be the most hated actor on the show just because he isn’t Michael Muhney. Why make it even harder for him and force him to play the role of a child killer? So, basically Jill Farren Phelps had no problem painting Michael Muhney’s character as a child killer. But, she is going to make the new Adam Newman come off as a saint, and maybe even a victim, in hopes that Y&R fans will accept him. 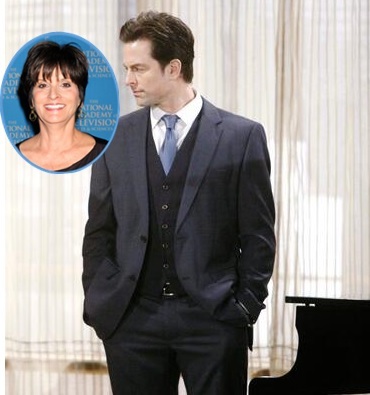 Do you think Jill Farren Phelps is setting up the storylines so that she can switch the blame from Delia’s death onto the shady character Stitch so that fans will take it easy on the new Adam Newman she will cast? Share your thoughts and theories in the comment section below, and don’t forget to check CDL later and tomorrow for more The Young and the Restless spoilers. Whoever they try and bring in is not going to work. Fans who are even still watching are not going to care one way or another if the Adam character is innocent of guilty if it’s not Michael Muhney. We never believed that Adam was guilty, we are mad because she fired MM. Can she get it through her thick head. It is not Adam that they care about, but the actor who played him. We don’t want him to be a saint, we want Michael back. We all know that JFP fired him because he was taking the limelight away from her precious SB (Steve Burton) and that EB (Eric Braeden) was jealous of MM’s acting ability and his over whelming fan adoration. In fact he has even admitted that he was behind the firing. Get a clue CBS & Sony and rehire MM, fire JFP and put EB on retirement. I totally agree that Jill is running Y & R into the ground. Firing MM might just be the mistake of her career. And while we’re talking about her bad decisions let’s mention Steve Burton. Taken from GH for a lame role that is losing him fans in droves. Bring back MM for everyone’s good. Doubt if this show will make it another year. MM is too good for y&r in the first place. If anything Jill needs to be fired for all the dumb decisions she’s been making. She makes the women appear weak, like victims. I mean, look at how dumb she made Victoria Newman. Helen Keller would have figured out billy’s affair sooner. And replacing Billy Miller?! Come on!!! How do you get rid of two powerful actors in one month and expect the fans not to react is beyond me. If you ask me I would dare say that Jill will be the death of y&r. If Billy Miller, or Michael Muhney doesn’t come back, my 25 years of watching y & r will come to an end. BRING AT LEAST ONE OF THEM BACK!!! Y&Rs numbers have dropped a lot due to MM firing. So, you’d think they’d be smart and bring him back. I watched for 18 years and I can’t any longer. I hate that they are getting rid of the good actors and recasting with people who can’t act. What do you think about the state of affairs on Y&R? Let us know please.